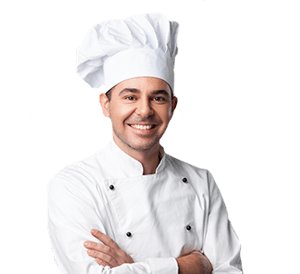 Whether you operate a restaurant, dining hall, or bakery, it is no simple feat to orchestrate the many moving pieces of your food establishment. 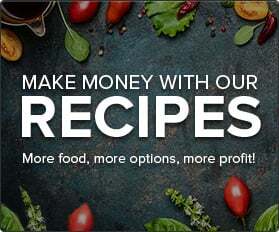 From eliminating food waste to ensuring you have sufficient ingredients and supplies, managing your inventory is fundamental to the success of your business. That’s why we’ve made it easy for you with Auto Reorder, which ensures that you will always have critical items on hand. Read all about it below. 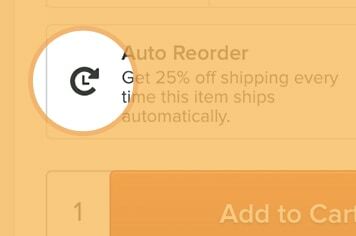 Auto Reorder enables you to schedule automatic product purchases that are shipped at set intervals of time. Only select items are eligible for Auto Reorder. They are noted on the site with an Auto Reorder symbol, which you can see on this page to the right. Below are the benefits that Auto Reorder can bring to you and your business. 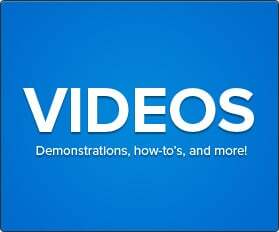 Below are the simple steps to create a new Auto Reorder. 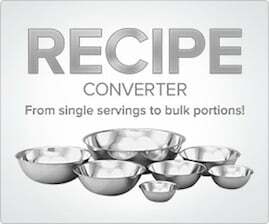 Select the product you would like to set up with Auto Reorder. Check for the Auto Reorder symbol on the product page to make sure it is eligible. 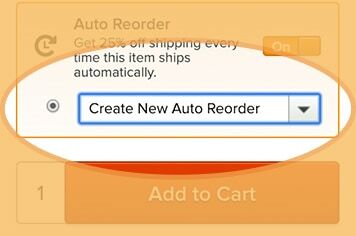 If this is your first time using Auto Reorder, add a new Auto Reorder to your cart. Choose your desired delivery interval of one, two, three, or six months. 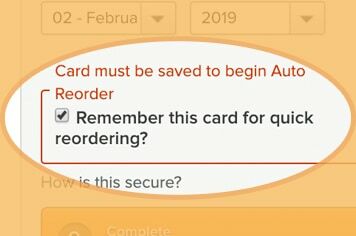 Check the box that reads, “Remember this card for quick reordering?” for future Auto Reorders, and hit “Complete checkout” below. 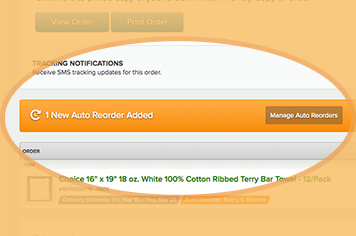 A message should pop up to confirm that a new Auto Reorder has been added. You should also receive a confirmation email. Take note of the Auto Reorder number and your chosen shipment interval, so you know when your product(s) will arrive. 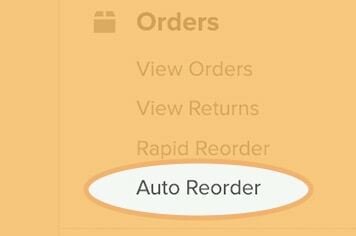 You can easily manage your Auto Reorders on the Auto Reorder management page. Below are directions to access your Auto Reorders. 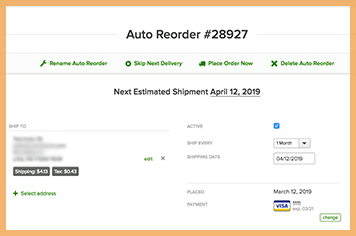 Additionally, we’ve included the capabilities of the page along with the corresponding area on the Auto Reorder Management page to the right. Below we explain how to access your Auto Reorder Management Page. Click on "My Account." From the drop-down menu, select "Orders." On the left side of the page beneath "Orders," select "Auto Reorder." You will see a list of your Auto Reorder product(s). 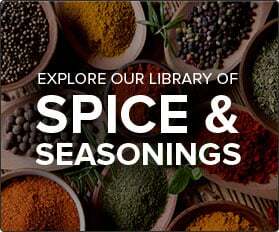 Find the product you would like to manage. 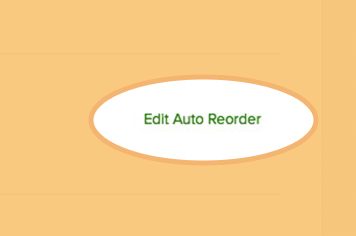 On the right, click the green "Edit Auto Reorder" text for the product. Your Auto Reorder Management page should come up. 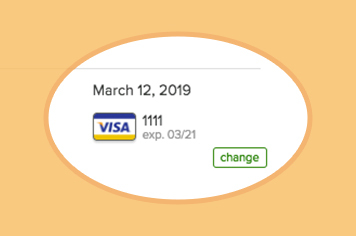 You can make a variety of changes to your Auto Reorders. See below for a description of the abilities of the page and where you can make those changes on the page. Each number on the image corresponds to a below action. 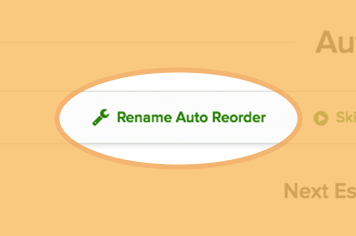 You can select the "Rename Auto Reorder" tab to customize the name of your order. 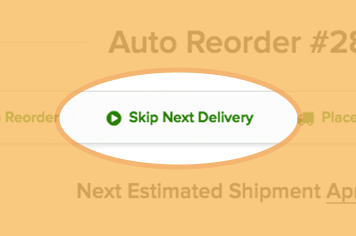 If you don't need your next scheduled order right away, you can skip it by clicking the "Skip Next Delivery" button. 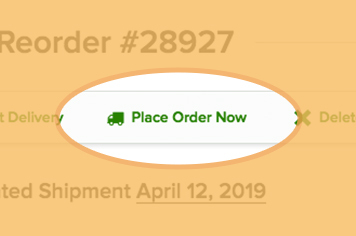 If you need your Auto Reorder shipped right away (instead of waiting for your next scheduled delivery), you can click the "Place Order Now" button. If you decide that you no longer want or need Auto Reorder for a particular product, you can cancel it entirely. You can either save your shipping address or edit an existing one depending on your needs. 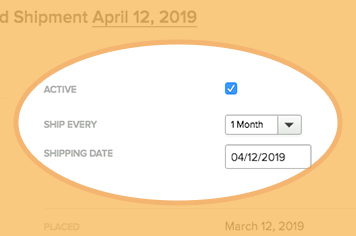 With this feature, you can change future Auto Reorder shipping dates. By selecting this option, you can choose a saved credit card from your account or you can add a new one. You can always change the product quantity in your Auto Reorder if necessary. 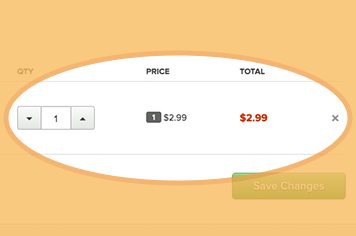 You can also click on the "X" icon to remove a product from Auto Reorder. For common inquiries about Auto Reorder, see the below frequently asked questions. I received an email titled “Auto Reorder Available to Merge.” What does this mean? 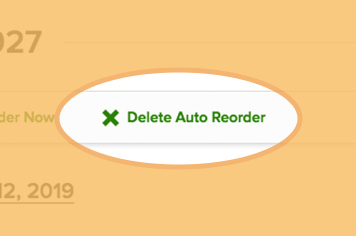 If you have multiple reorders in your account, this means that you have opted to be notified if your Auto Reorders can be merged. You can click on the “my account page” link in the email and opt to merge your orders if desired. What does it mean to merge my Auto Reorders? Merging your Auto Reorders means you are choosing to combine your orders to be shipped together. This helps you save on shipping, as you are only paying the shipping fee for one shipment as opposed to multiple Auto Reorder shipments. How can I merge my Auto Reorders? 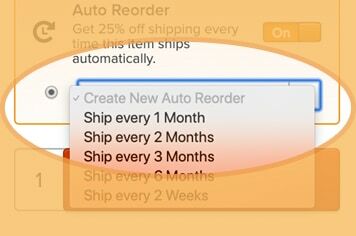 If you’d like the possibility to merge your Auto Reorders, there are 2 options to do so. In the first option, you can check the box on your management page. You will be prompted to merge your Auto Reorders through email, and our system will merge them for you. 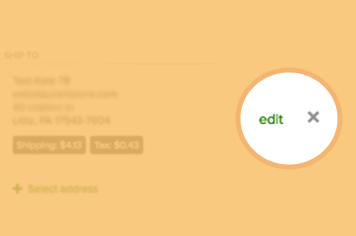 In the second option, you can manually merge your orders when you are initially setting up Auto Reorder. You would simply add multiple items to one Auto Reorder. 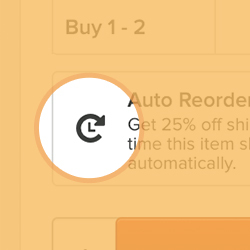 How does Auto Reorder differ from Rapid Reorder? 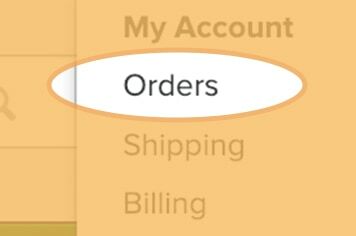 At the top of the homepage next to “My Account,” you will see a button titled “Rapid Reorder.” With this function, you can view a list of items that you have bought in the past. 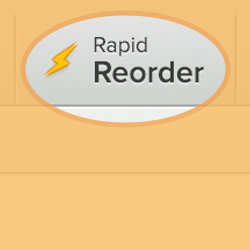 Rapid Reorder makes it easy to re-order your items by eliminating the time you would have spent re-searching for products. 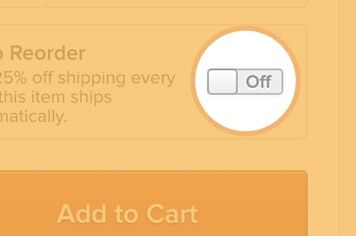 Like Auto Reorder, it saves you valuable time by enabling you to order items quickly. 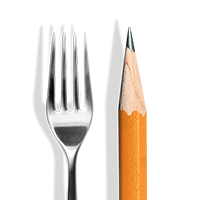 We are committed to providing foodservice professionals with the information and tools they need to thrive in the industry. With functions such as Auto Reorder, Rapid Reorder, and WebstaurantPlus, we help you and your business save valuable time and energy without cutting into your bottom line.